The freeways of Chicago can be dangerous places. Most of the time, you get on the freeway and get off on your exit without a hitch. You get to your destination safely—but not this time. 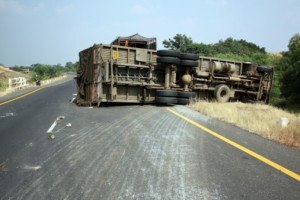 After being involved in a trucking accident, it is common to have a lot of questions. Is my job safe? How much time will I have to take off of work? How much will much will my insurance company cover? Am I liable for the damages? Speaking to a trucking accident lawyer after your accident can help to answer some of the questions that you have. CALL YOUR CHICAGO, IL TRUCKING ACCIDENT ATTORNEY AT 312-372-7250 OR MESSAGE US HERE! THERE’S NEVER A CHARGE UNTIL WE WIN! Contacting a trucking accident attorney at Kurasch & Klein immediately after your crash can help you remember to include the important details about what happened. Gathering tractor trailer accident information from a Chicago accident lawyer is the best way to assess your case. Kurasch & Klein is a personal injury law firm based in Chicago who can help you fight for justice in your truck accident lawsuit. Client service is always our top priority, and we will be there every step of the way in your trucking accident case. Contact the trucking accident lawyers at Kurasch & Klein today for help with your case.